The symbolism of astrology can help us understand how the kind of security ancestral roots and "home" foundations used to provide can be replaced by a new kind of inner stability. What we need to do is to consider carefully what is meant by the fourth house in the birth-chart. A young person graduates from college where he has lived and studied for some years; perhaps he is released from the Army after several years of training and service in unfamiliar cities and amid strange people. The young person has gained knowledge and experience; he has come in contact with many youths who also were seeking to find out what the world was all about, what people had thought and accomplished in past centuries and what seemed to be the job ahead for their own generation. The young person has discovered to some degree how he has behaved when encountering strangers, young and old; how he has met the tests of study and of friendship, of academic examinations under pressure, of life in fraternities and of rather hectic excursions into the dark borderland of those jungles, our big cities. He has indeed encompassed a great deal of, to him, new material; he has accumulated knowledge and memories, techniques and personal hurts, fears, blockages and complexes. He is aware of what he likes or dislikes, though this awareness is often rather vague and uncertain. Now, however, he is "free" in a world which has very little concern about him and which may well appear confused and chaotic. He is "free" to do what he chooses. But how is he going to choose? On what basis can he make his decisions and selections? To what purpose will he use his newly acquired knowledge? Obviously, a new step must be taken; but what should be this next step? As a rule, whenever possible, the young person goes home. But usually this going back home after a more or less extended period of adventuring and of learning "the ways of the world" is not a very deliberate gesture charged with profound individual significance. It is just the thing to do; we do it as a matter of convenience and custom and because our instinctive and natural feelings are involved and lead us back to our folks. There are many cases also in which the young man, quite consciously and deliberately, feels the need of going back to his life roots and investigating, kindly but critically, the beliefs, the ideals, the patterns of everyday behavior which, in his childhood, he took for granted, never even thinking of questioning their validity; now he is determined to question this validity. There are instances also when the youth feels sick and weary and wants to nurse for a time his physical, emotional or moral wounds; in other cases, he is totally confused and hurt to the quick; he can think of nothing except recovering his early childhood faith and identifying himself once more completely with the traditions and way of life of his ancestors. The "return home" is not only something which happens at the end of college years or military service. It is an ever-present fact of our inner life and a challenge to our ego. Let us say that we experience something new; we go, into it impulsively; we risk in the fray what we have and our very strength; we are hurt or elated — and through it all we either learn new and valuable lessons or we shrink back, hurt and defeated. Then comes the question: What next, little man? The next thing to do is either to go back to that which is the very foundation of one's sense of security and strength and tap once more the power and vitality of our own roots or to establish, on the basis of what we have learned and experienced, a new sense of power and of inner security. In either alternative, we are seeking to evaluate what we have discovered; to find where it fits; to "place" it in relation to something that we consider sound, solid and stable. We can do it in a rather automatic and instinctive manner by comparing the new facts with those things which, at home and in our childhood, we have taken for granted as being truly worth while. But we may also have seen our ideas of value, our sense of like or dislike so extended or changed by what we have experienced away from home that we do not want any longer to judge according to what our ancestral tradition tells us is right or wrong. As I use the word "home", I do not mean only the physical, or even parental, aspect of the usual home. I am speaking of whatever has given us our first feeling of stability, the feeling that we "belong" to something fundamental and vital, something with a past and a future, something that has roots and is to us also a life-giving root. Every person needs this feeling of stability. No one can really understand or give value to the many events occurring around him and to the varied encounters with people who pass and go unless he can refer them to something that is stable, a mentally significant, and emotionally satisfying "frame of reference". The question is: Where do we find it? It is evident, particularly today, that the parental home and all that goes with it does not always provide the adolescent with a stable "frame of reference". The home may be racked with conflicts, broken up by divorce; what is taught at Sunday School or seen on TV programs may dismay or confuse the sensitive child able to contact opposite points of view in books or through friends. The young person may, therefore, either refuse to accept wholly the "roots" which his home provides him with or soon discovers that there are no life-giving roots, no stability in his home. Then he finds himself in a difficult situation. He cannot refer the knowledge he has acquired or the experiences he has (as he moves about in his community, village or city) to anything dependable, basic and secure. Everything changes and fluctuates; there is nothing that is reliable and permanent, at least relatively so, nothing to return to when new experiences must be evaluated and understood. When this happens, the youth must find stability somewhere else than in the usual home, or even in his social tradition, ethics or religion. There is nowhere else to seek, essentially, except within himself; but before he comes to realize the full implication of what this means, he usually has to pass through many crises during which he discovers that every substitute "home" he has been trying yearningly to adopt proves inadequate. How can he be guided in his search for this elusive, yet so necessary, stability? This is the question which a vast number of youngsters and supposedly mature people ask of psychologists today because the solutions which the philosophers or religious teachers of older days have presented, and keep presenting, seem ineffectual or lacking in convincing power and root vitality. But most psychologists have likewise no real solution to offer, for they can only show to the confused and disturbed men and women of our hectic age the road to conformity. "Conform. Be adjusted — and all will be well." Will it really be well? Is this another opiate to calm the restlessness of the uprooted men and women of our cities to the point where it will not do too much harm to themselves and to society? Can all be well until men find a new quality of stability in their lives, a completely new approach to the very problem of stability? The symbolism of astrology can help us understand in a very graphic manner how the kind of security ancestral roots and "home" foundations used to provide can become replaced by a new kind of inner stability. What we need to do is to consider carefully what is meant by the fourth house in the true birth-chart (that is, a chart erected for the exact moment and place of the "first breath"). In ordinary textbooks, it is said that the fourth house refers to the home, to one of the parents (opinions vary as to whether it is the father or the mother), to real estate and the present place of residence, also to the "end of things" — which, of course, may mean the return to the dust of the ground whence we come, as is said in the third chapter of Genesis. But the fourth house has a still deeper and more basic meaning in terms of the essential experience of the individual person, able to assert his own self. The basic meaning of the fourth house is obscured by the fact that most astrologers still think of the cusps (or beginnings) of the twelve astrological houses as occurring in the zodiac. A truly modern astrologer should realize that what makes the houses so significant — indeed, in my opinion, the most basic factor in a psychologically oriented type of astrology — is that they are equal divisions of the space surrounding man, as he is born and lives on the surface of the earth. The twelve houses constitute the basic framework of the individual human experience; they are twelve basic "fields of experience", passing through which man grows (or should grow!) to maturity as an individual person; they symbolize our world in its totality. This world starts at the surface of the globe. The "natal horizon" of a birth-chart (the line from the true ascendant to the descendant or seventh-house cusp) is a representation of the surface of the earth, on which man breathes (first house) and comes in contact with all that lives with him on this surface (seventh house). This "natal horizon" is, in terms of man's personal everyday experience, the horizontal line which he follows as he lies down and sleeps. The meridian (the line which marks the beginnings of the fourth and tenth houses of the astrological chart) represents the vertical line, to which he aligns himself as he stands erect, asserting his selfhood, his verticalness of being, his full stature as an "I am". This vertical or "plumb" line reaches up to the zenith and down to the nadir of the space surrounding man on the surface of the globe. At the zenith, we see stars if it is night or if we can see through the glamorous light of the Sun. But if we try to look for the nadir, we find at first only solid substance — that is, the ground on which we stand. The first and obvious meaning of the nadir and of the fourth house is, therefore, this ground — we stand on it, we build on it. The fourth house is the "solid ground", the place of our "life roots", the "foundations" of whatever we build as an individual seeking to assert his own "I am" in a stable and relatively permanent manner. (1) We stand on the ground as we establish our own body stature, as we walk toward what is needed to fill our essential needs or to run away from dangerous contacts. (2) If we consider ourselves as parts of a larger community, as members of a particular society, culture and ancestral line, we find ourselves rooted in the psychic substance and "soil" of a collectivity of human beings; indeed, we often are not even completely emerged as true "individuals" from the psychic envelopes (or "wombs") of our mother, our tradition, our Church or Party — that is, of all that has established for us, from the very moment of our birth, the fundamental way in which we should face the world and adjust ourselves to the pressures (the "line of gravitation") of our society. (3) As the time comes for us to follow the example of our elders and as we come of age as a (supposedly) mature personality, we marry and think of building ourselves some kind of home — whether or not it means an actual house we own. Then we take a stand in our society as a builder of home; if we are to make a real success of it, we must seek, first of all, to build solid foundations. These "foundations" may be psychological far more than actually made of stone; but in order to make them, we must, symbolically, dig down into our earth; we must do so in order to reach rock-bottom stability. This is as far as most people dream to go, insofar as their "fourth house" experiences are concerned. Yet the ground may be shaken from under your feet; you may become uprooted by wars, by necessary changes of occupation, by sudden losses or conflicts with your neighbors. The home you built, however securely its foundations seem to have been erected in the "rock" of faith, tradition and morality, may be taken away from you by society or natural storms. Where are you then? Where do you stand? How can you stand erect and say: "I am, and this is my world, my certainty." The answer is that you can dig farther down into the earth until (symbolically speaking, of course) you reach the center of the earth. As you "reach center", you shall find that you have reached your own center. You have become a "global" being. You are now like a planet moving in cosmic space, circling about a sun in company of other planets. You have become the citizen of a celestial society. You are in the kingdom of heaven, and the kingdom of heaven is within you — at the very center of your integrated and global personality. It is this change from "foundations" to "center" that I was hinting at a while back. It is a change of essential quality of consciousness and of feelings, a fundamental change in a person's approach to the problem of discovering a kind of stability and permanency which nothing can destroy — not even, in due time, death itself, provided the change is thorough enough. However, much is demanded of the human being before this change can be brought about. If one is busily engaged moving about and seeking an ever-larger field of operation on the surface of the earth or if one is sure that the only way to gain stability is to build heavy foundations out of "stones" (i.e., of the ancient dogmas and set traditions of your society), then one never will reach the "center". But, in the majority of cases, it is best not to try to do so unless one has a strong determination and intense faith and unless all else has proven unsatisfactory and hollow. A time often comes, nevertheless, when we have to choose what we truly seek and desire to reach. It is the strength of our desire which will make the decision, for every man chooses what he desires most, what he feels for most eagerly, what he believes in most implicitly. No choice is of itself wrong; none is basically greater than any other. What counts is simply whether or not it is your choice, whether it is the right choice for you at this particular time of your development. The process of reaching the center of our own global being is a very difficult and strenuous one. One can think, as an illustration, of the struggle necessary for a tree to send its tap root straight down, through rocks and clay, toward the center of the earth; of a man seeking to drill an oil well at great depth. But in these or similar illustrations, the problem is to tap some substance which lies deep under the surface, water or oil. The man who seeks to find stability at the center of his being cannot be deviated from his purpose by whatever resources or wealth he may encounter on the way; he must not stop until he has reached center. As he goes deeper and deeper, the pressure and resistance of earth materials grow greater, the heat is more stifling; but if he persists, if he is lured away neither by the excitement of the world on the earth surface nor by whatever wealth he may come to tap as he digs on; and if his strength holds out and he does not lose faith and courage, the individual must someday reach his goal. There he will find that, at the center, gravitation ceases; no heaviness is left; all "burdens are light," as Christ said. At the center, everything is perfectly balanced; one may move in any direction; every direction is the vertical; every direction radiates from one's creative self. Stability is perfect; yet it is a stability which brings one into a new and far vaster realm of being, where many new and greater problems arise. If one has reached one's own global center, one begins to operate in a dynamic, creative sense. What makes the motions of the planets and stars so stable in their orbits is that they move on. If they stopped one moment, everything would explode or disintegrate. The stability of rock foundations is a static kind of stability; the stability reached at the center of one's self is of an intensely dynamic type. If it is not dynamic, then it is not the real center. If the process — often a tragic one — then, too, one may be sure that what has been attained is not this real center. In any case, all experiences which the individual encounters in his search for stability and a secure basis or center of operation can be, astrologically speaking, referred to the fourth house of the natal chart of this individual. Obviously, what such a fourth house will show can at best be a most general indication of the type of experiences to be expected in this search. But, even so, a study of the natal fourth house and of the planets (and other factors) which may be found in the house should be deeply rewarding, if properly undertaken. 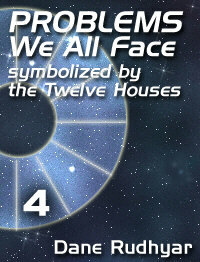 The first and basic factor to consider is the nadir point of the chart: the cusp of the fourth house. The zodiacal sign at the cusp and, if one is sure of it, the exact degree at this nadir point tell a basic story. From them, we can infer what the individual's characteristic approach to the problem of stability and of personal integration will tend to be as the result of his experience. The zodiacal degree of the natal nadir point indicates the path to the center of one's being because if one follows the line of gravitation which passes through the head, the erect spine and the feet, one reaches, first of all, the center of the earth; then the antipodes of the birth-place; and finally, in the sky of the antipodes, a certain point whose zodiacal longitude is that of the cusp of the fourth house. Whether one ever reaches the kind of stability which is found at the core of one's inner being or one is content to find an at least temporary security and base of operation in a solid, concrete foundation just below the ground's level, the cusp of the fourth house shows the way that destiny, or God, has prepared for you. It does not tell how far you will go and what will satisfy you, but it shows the manner in which you will have to approach the problem as a result of your life experiences since birth. In this fourth house field of experience, one deals with most intimate matters the moment one attempts to go beyond the surface concern with home, real estate, etc. Thus, examples out of the lives of famous people do not always lead to obvious results. This is the realm of "depth psychology" in the truest meaning of the term. There one is seen at a level which he usually seeks to hide from others, the more so the more he is a public figure. But the study of the fourth house is, therefore, a particularly fascinating study in any psychologically oriented approach to astrology. It is, moreover, one which would fill a very great need today, for modern men and women grow ever more insecure as the ancient foundations on which our civilization was built are seen collapsing or at least are found sadly in need of basic repairs. Out of insecurity and uncertain foundations, our uprooted individuals lose increasingly all sense of real and permanent value. Every effort should, therefore, be made to help people to reach their own centers by approaching in a new way the problem of how to find some stable basis from which they may begin to act as dynamic and creative individuals.